Background image of Bush courtesy of Getty Images, modified by me. Click image to enlarge. Another war criminal and ultra nationalist has gone home to roast. 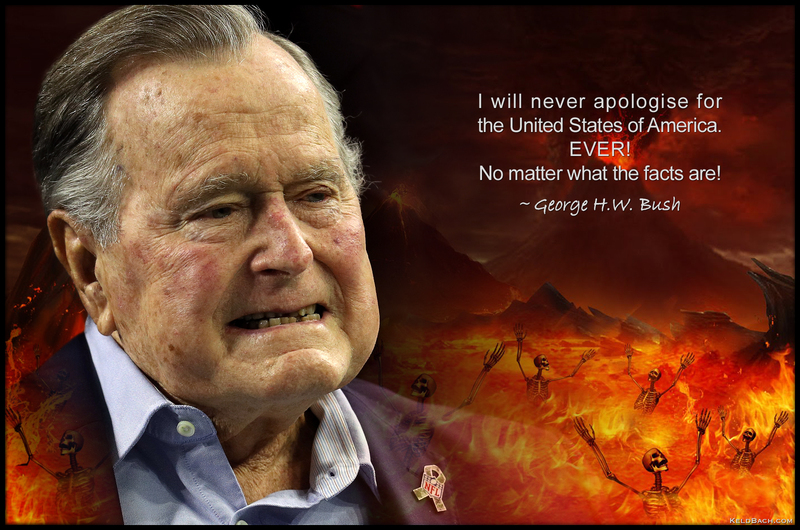 The quote is from George H.W. Bush’s presidential election campaign in 1988. See also: Oil tycoon, CIA chief, President: George H.W. Bush was the epitome of American empire and The Ignored Legacy of George H.W. Bush: War Crimes, Racism, and Obstruction of Justice. This entry was posted in Imperialism & Colonialism, NWO & Global Governance, Photography & Art, War & Terror and tagged American Exceptionalism, George H.W. Bush, USA. Bookmark the permalink.